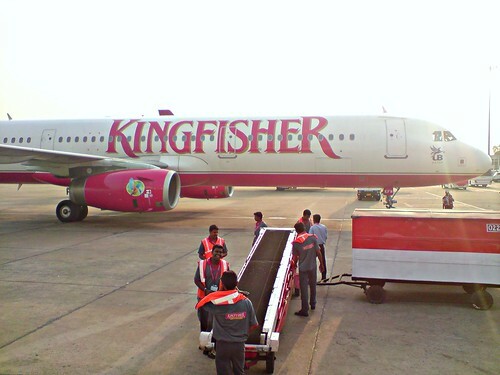 It’s not just the strike that’s keeping Kingfisher’s fleet grounded. India’s aviation ministry has supported the striking workers by suspending the airline’s ability to fly until it starts paying back employees. Kingfisher Airlines extended its partial lockout this afternoon as negotiations between management and striking employees remain at a standstill. The Mumbai-based airline was forced to suspend operations on Monday; the result of a flash strike of airline engineers and pilots Sunday evening. Groups of employees held temporary strikes throughout the summer to protest the company’s withholding of their salaries since March; however, this is the first time the strike has resulted in grounding the Kingfisher’s entire fleet. The Kingfisher fleet will remain grounded until employees end their strike and management pays their March salaries. Photo by Ashok Prabhakaran. The airline released a statement Thursday afternoon announcing that flights would stay grounded until October 12, which is 8 days longer than originally expected. “We regret that the illegal strike has still not been withdrawn and normalcy has not been restored in the Company, thereby continuing to cripple and paralyse the working of the entire Airline,” said Prakash Mirpuri, VP of Corporate Communications, in a statement. The airline promised to pay employees’ salaries from March within the week in an effort to reach agreement, but their statement had no effect on the employees’ decision to continue to strike. Chairman Vijay Malloy recently announced foreign carriers were interested in buying a stake in the cash-strapped airline after the Indian government relaxed its foreign investment regulations, but it is unlikely to come to fruition as even its current investors are hesitant to flush away funds in the ailing airline.